With the NBA draft one week away, I wanted to get on the record with my semi-official big board draft list[1. I can't write I told you so if I don't tell you anything before hand.] Previously I gave my take on the near top of the draft after the big two of Ben Simmons and Brandon Ingram, but here I want to present the whole list. The results are sorted by an ensemble of two models including my scouting informed PAWS model and a version using a mixed effects regression model that allows the performance and age variables to vary based on the tier they were drafted with three even tiers. 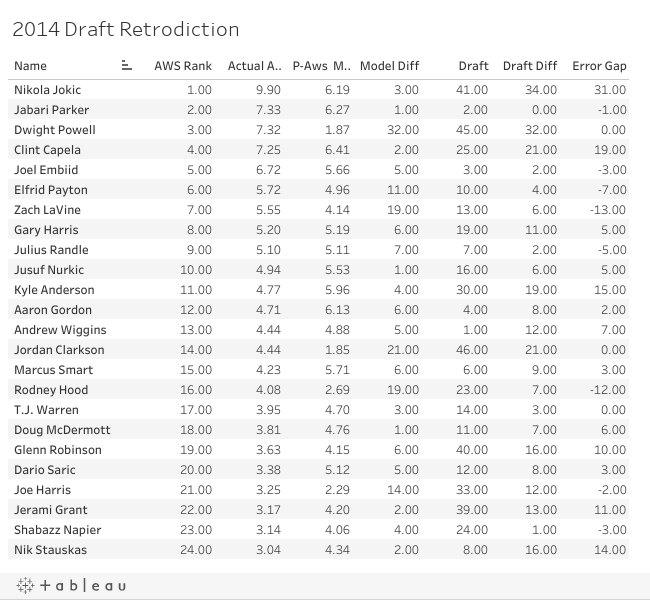 Draft model is then applied using a Monte Carlo model to project the odds of the player being selected in each tier based on the the Draft Express mock draft. (I hope to do a later post with a bit more detail on the Tiered PAWS model). The biggest surprise of the first round is Diamond Stone, projected on the bubble of the first and second round projected as the the third best prospect by the combined models, though the differences between Stone, Dragan Bender, Jakob Poeltl, and Denzel Valentine are virtually meaningless in terms of expected success. This group goes a bit beyond the top sixty in order to include some players on the bubble of being drafted. The big mover, in the opposite direction compared to scouting expectations is Jaylen Brown. 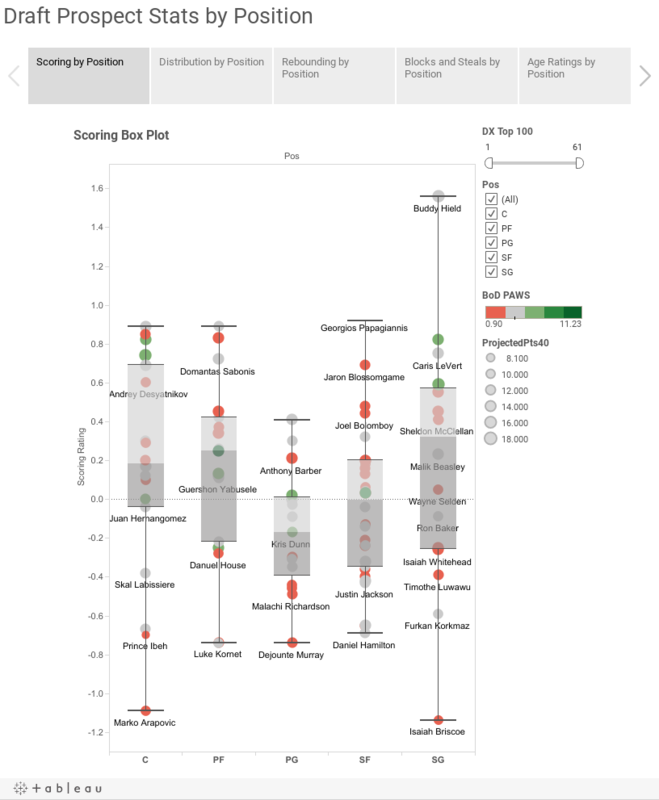 Brown does particularly poorly in the tiered model, which gives greater weight to the statistical performance on top tier prospects, an effect that usually increases their score, but Brown's poor statistics in college are too bad to lift his projection. In this visualization you can tab through the categories, filter by ranking from Draft Express, and scroll over to find or highlight names. 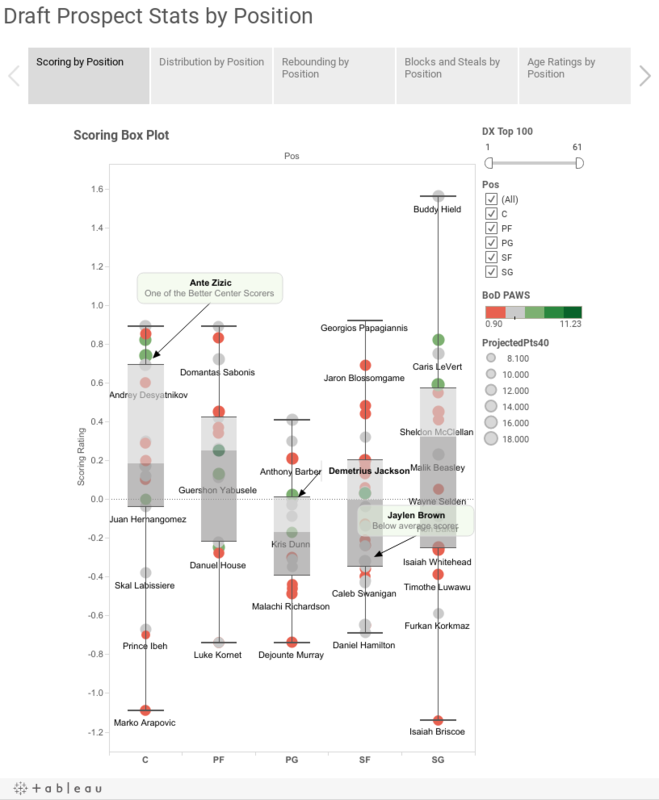 Statistical visual highlights include how much Buddy Hield stands out as a scorer, Denzel Valentine as a distributor, Kris Dunn stands out in blocks and steals, Dragan Bender and Brandon Ingram in youth and Ben Simmons in the overall draft model rating.